When i got my new branded laptop of worth Rs 58,000, sitting cross-legged with the newly bought laptop on my lap, excitedly I was busy video-flirting, with a lassie, whom I had met 3 weeks ago at Platinum bar. I was alone staying in my semi-dark room. The light glowing from my laptop screen was the sole source for vision for movement. I could hear all my family members, in the veranda, giggling and attacking at one another’s opinion with their unnecessary comments. My grandma is abit different from others. She sits aside in the corner, stays calm, sometime sneer and spend most of her time scrutinizing over how my family members waste their valuable time over rubbish. In the midst of flirting, lost in the excitement as i was, i didn’t realize when my chortle had reached my grandma’s ears. Though A octogenarian suffering from hypertensions my grandma listens well and often walks two kilometers every morning unlike the neighbors of her age who have made it a rule to visit clinics most of the time in order to save whatever warning life they have . I dimly sensed her tiptoes at the door step, but would not lift my eyes on my room carpet to check what she was up to. On her part, unable to trace me in the semi-dark room instantly, she rolled her eye around the room through the half-opened door and finally located me at the corner. I was glued to my new machine after managing to catch a glimpse of her which was enough to see her make faces the she used to during my childhood. But i also managed to realize that one of her glasses had a crack and curled/criticized my father for his inability to extract some time from his busy schedule to charge it. I was in the middle of a crazy joke for the girl when i figured out my grandma’s relflections in the screen. Oops! She had already taken seat, in the bed behind me and started scrutinizing my tricks. I minimized the chat box and pretended as if I was pondering over some complicated numerical problems. I felt odd flirting with a girl infront of my grandma. One shouldn’t take her interference as the first one; in fact, she has been scrutinizing most of my activities since my childhood. She keeps track of every moves of mine. Now also, she was curiously eyeing upon the sequence of reactions in computer things. 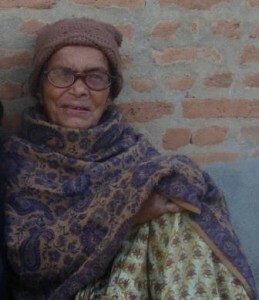 She already knew that her entrance in the room had make me physically still and quieter than before, her sitting beside would make me close the chat window and her ‘ now what?’ look would make me play ‘Om jaya jagadish hare’, a melodious hymn by Anuradha Poudel, one of the favorites of my grandma. Sometimes I wonder my grandma must have worked in CIA or FBI at her early age. There is a story to tell behind this. Two months ago, she caught me read-hand, staring at a picture of my ex-girlfriend with whom my relationship hadn’t lasted more than 5 weeks. I had a collection of her pictures in my computer. I didn’t know for how long, she was accompanying me. I was late enought to close the window. ‘Is she Brahmin?’ she interrogated. ‘she is Gurung but her mother is Brahmin’. My wordless mouth replied. ‘who is she?’ She continued to attack me. I blurted, ‘a close friend’. I could see the fading reflection of my grandma on my laptop. She was waiting me when I would play a hymn for her. Without any delay, with my double click, ‘Om jaye jagadish hare’ echoed in the room. I could see my grandma’s face glowing with eternity and satisfaction. Such interactions among me, computer and my grandma were the part of my growing up. Four year ago when I was studying in grade 9, I had taken Computer as an alternative to optional math, the very fact that I was bad at numbers then. I felt the acute need of a computer. Infact all my class mates had already owned. My father was continuously putting off my request saying that he hadn’t been able to replace the 5 year old black and while television, so computer was a far cry for him. I remember my grandma interrupting the conversation between dad and me. ‘What is this computer?’. She inquired. ‘It is something like television without remote’, I blurted out without thinking too much. I know it was stupid reply but at the same time I didn’t preferred a her long definition. ‘Will you play ‘Om jaye jagadish hare’ for me?’, she asked after mulling over my statement for a while. In ecstasy I instantly promised her to play the religious numbers for her whenever she wanted. I had already known that how my grandma had to wake up at 5 am early morning to watch Anuradha’s religious visual songs which would be given only once a day. My grandma deserves all the credit for the computer set i bought 4 years ago. which i chose to sell it to cover the price of the latest series of laptop i own right now. It brought a hell upon me- my dad was violently against it. How can i forget the moment ? Getting a dextop of Rs 46,000 at a time when computer was too by a purchase for a middle class family, was not cut and dried venture. It had cost my grandma’s 2 tolas of gold bracelets and other silver ornaments which was handed over by her mother in law right after her marriage with my grandpa. Today I own laptop from a latest series but i regret for making my grandma sell her gold to fulfil my stupid demands. I am afraid i will never cover up for my grandma’s gold. How will i return her cultural attachments and identity she carried with those gold bracelets at that time ? How would i justify her sacrifice for stupid grand child like me? My grandma is getting older and older while I am still dragging in undergraduate and not ready to earn yet. I will be very unhappy if i fail to return those golds to my grandma before she leaves this world. So, I still see the fading reflection of my grandma on the LCD screen, far away from home. i hope you get to pay your debt in time. You can repay her love by giving her more time out of your daily schedule. I think she will love watching bhajans at youtube & Ramayan episodes also. You can also show her some nice photos of around the world or upload her pictures or videos on your computer. You can also teach her a little about the computer. Hope you two have a good time together. Shekhar i remember u saying this was a fiction….so is it or is it not? skc dhilai bhaye ni padhiyo.